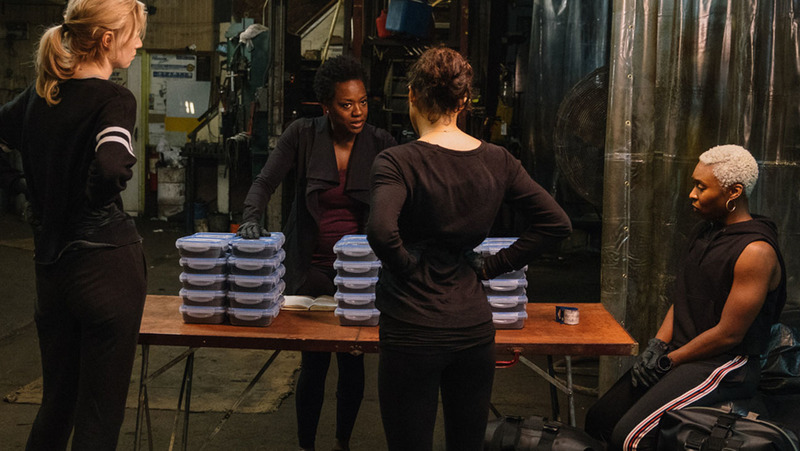 Steve McQueen's follow-up to 12 Years a Slave is no standard thriller; Widows has the smarts and subtlety to match a plethora of excellent performances. Where exactly do you go after winning the Oscar for Best Picture? Not that accolades necessarily define a filmmaker’s career, though the film world’s most prestigious award definitely ramps up expectations for what’s to come next. With that in mind, Steve McQueen eventually landing on Widows for his first feature project since 2013’s 12 Years a Slave seems an unconventional, and inspired, decision. Based on the Lynda La Plante series of the same name, a British crime drama that ran in the mid-’80s to great popularity, Widows follows a group of women who, after the deaths of their criminal husbands in a job-gone-wrong, attempt a daring heist in order to pay back the man from who their husbands stole. The basic set-up promises thrills and spills, yet McQueen’s sophisticated approach and handling of the material elevates the premise to impart weighty-but-reserved socio-political commentary. With hidden depths, it feels entirely relevant for the troubling times we live in. The original series was London-based, but for this adaptation, McQueen has uprooted the story to American soil and the city of Chicago. Widows succeeds on multiple levels: as a examination of contemporary US politics, it explores a variety of topics succinctly (a landmark one-shot is bound to linger long in the memory), magnifying issues of wealth disparity and institutional racism without diverting from the fundamental narrative drive or descending into preachiness. As a heist movie, it remains supremely entertaining, ticking all the right boxes whilst eschewing the genre’s frothier tropes. This is no Ocean’s 8. For these women, pulling this off does not mean a better life. It means survival. The ensemble cast must go down as one of the best in recent years. Viola Davis, as per, gives a powerhouse performance as Veronica, the natural spearhead of the group trying to break free from the looming shadow of her mastermind husband Harry (Liam Neeson). She is steeliness personified at times, yet her multifaceted portrayal of grief allows for moments of vulnerability. In both modes she shines – there is little Davis can’t do. Determination is burnt onto the faces of these downtrodden women. Elizabeth Debicki, as fellow widow Alice, takes to her heist preparation duties with an increasing guile. Debicki is a particularly fascinating screen presence, though Widows is a true ensemble picture. The screenplay, co-written by McQueen and Gone Girl author Gillian Flynn, shares out screen time generously to a wealth of acting talent, from seasoned veterans like Davis and Robert Duvall to relative newcomers Cynthia Erivo and Daniel Kaluuya, all aided by McQueen’s efficient and rarely glossy direction. Intertwined with the central plot is the election race between Jack Mulligan (Colin Farrell), tied to the city through his heavyweight father’s (Duvall) long associations in city government, and Jamal Manning (Brian Tyree Henry), a local African-American man looking to represent the people’s interests – and also the gang boss to whom the widows are indebted. Kaluuya, maintaining his blazing hot streak, appears as Jamal’s brother and enforcer Jatemme. His performance in Get Out was one of the most sympathetic of last year; here, he is utterly terrifying, intensely apathetic in his attitude towards dishing out violence. No one disappoints in Widows, but Kaluuya and Debicki have further distinguished themselves as extremely compelling young talents. The prestige in front of and behind the camera, on the whole, comes together to produce a compact, absorbing drama, tackling grief, power and the ubiquity of corruption without trading in on an ounce of entertainment value. A rough gem of a film, but a gem all the same. Widows (2018), directed by Steve McQueen, is distributed in the UK by 20th Century Fox, certificate 15.